This customer required a precision cleaning line. The process required ultrasonics as well as turbo/filtration for the primary wash followed by DI rinsing and hot air drying. 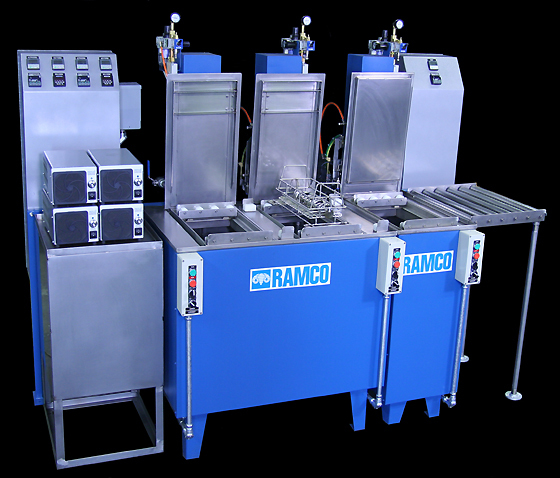 RAMCO has been building precision cleaning systems from the unique Console Series for over a decade. The key to its success has been the adroit use of the process elevator sequenced with powerful ultrasonics and turbo/agitation. The turbo/agitation washing removes gross contaminants and the ultrasonic cleaning the finer and/or more resistive contaminants. The result of this very effective processing routine is faster cleaning and more effective processing. 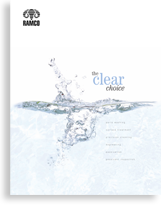 The steps are sequenced with digital cascading timers for agitation washing and ultrasonic cleaning phases. The ultrasonic stage can be set to provide vertical oscillation of the work during the sonic cycle. A selector switch is provided for static ultrasonic or oscillating ultrasonic modes. And using our MultipleRollover feature the dual mode process can be repeated for any number of preset “rollovers”. The RAMCO ultrasonic system provides superior ultrasonic washing action over conventional (static) systems by moving the work through the peaks and nodes of the wave energy. 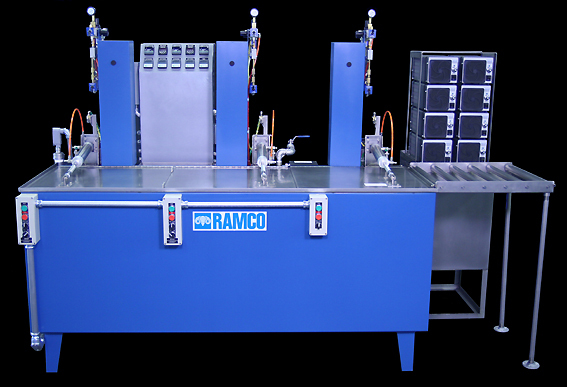 RAMCO Hot Air Knife Blow-Off Dryers have been proven to be very effective for rapidly drying parts. The key to the process again is the process elevator. It is used to produce changing flow patterns that result in dynamic drying (i.e. platform oscillation combined with hot air flow). The effect of “dynamic flow combination” is better coverage of component surfaces, maximum evaporation and accelerated processing times. Ramco Dryers get maximum evaporation for rapid drying without excessive heat. Air is recirculated, heated and directed into the drying chamber via adjustable air knives. The elevator constantly oscillates the workload in and out of the hot air stream. Humid air is displaced with just the right amount of fresh air using adjustable vents to maintain effective air quality within the chamber. The dryer is electrically heated and includes a digital indicating temperature controller, high temperature manual reset and an air flow proving switch to protect the heating elements.